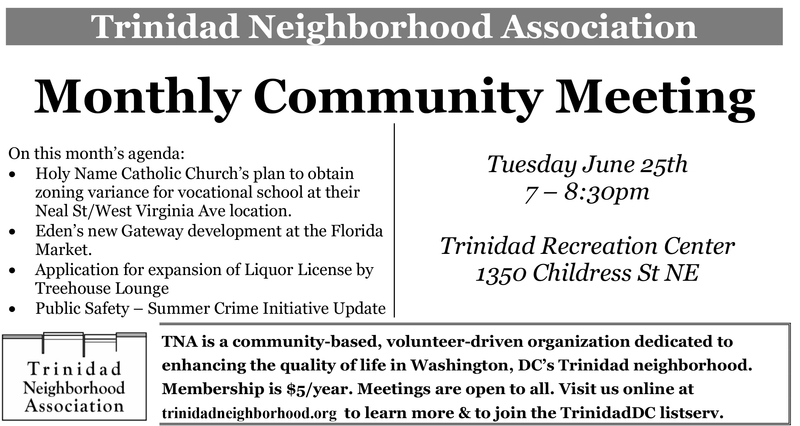 Please join us on June 25 at Trinidad Rec Center! This month representatives from EDENS (the folks behind the new Union Market) will present details of the proposed Gateway Market & Residences project, which will be located at the corner of 4th St. and Florida Ave. NE. We’ll also have updates from MPD-5D and neighborhood ANCs. As always, we’d love to hear your community announcements! After this meeting, we’ll be on summer break for July and August and will meet again on September 24. DDOT has initiated a multimodal safety and planning study of Florida Ave. NE. The first community meeting was this past Wednesday at Gallaudet University, and the next public meeting will take place in September. In all, DDOT plans to have three public meetings for the study. Please sign up for updates on the study’s site, and be sure to add your comments to the interactive map. This past Monday, June 17, Councilmember Muriel Bowser, Chairperson of the Committee on Economic Development and Councilmember Kenyan McDuffie, Chairperson of the Committee on Government Operations held a joint public roundtable on the surplus and lease of the Webb School property to KIPP DC. You can read TNA’s testimony here, and more about KIPP DC’s Webb Campus here. Thank you to all the neighbors who helped make this year’s TNA Garden Tour a smashing success! Check out some photos from the day on Frozen Tropics. Tags: DDOT, EDENS, Florida Avenue, Garden Tour, Holy Name, KIPP DC, TNA, Tree House Lounge, Union Market, Webb E.S. 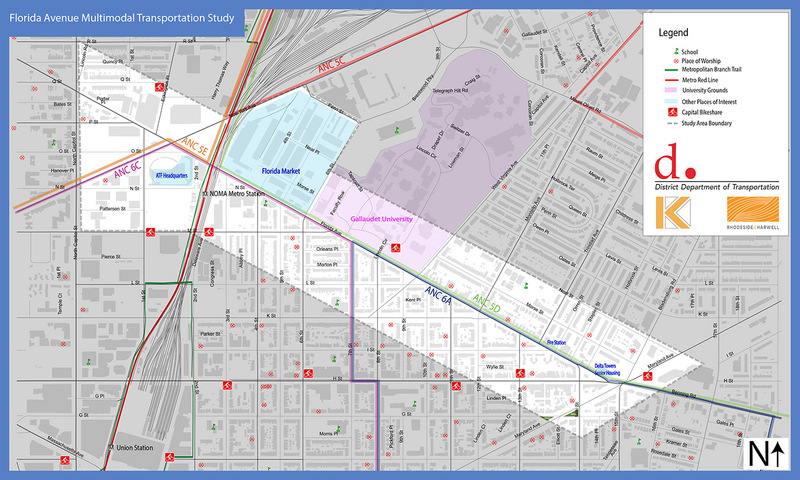 The DC Department of Transportation (DDOT) has initiated a multimodal safety and planning study of Florida Avenue, NE. Focusing on the Florida Avenue corridor from New York Avenue to H Street/Benning Road (open a larger study area map here), the study will evaluate safety, streetscape, and operational enhancements to improve safety for pedestrians and bicyclists while ensuring all users have safe access within and through this important corridor. A critical link in the District’s roadway network and part of a bourgeoning area of the city, Florida Avenue, NE is a complex corridor with multiple land uses, varying roadway conditions, and important transit connections. The corridor serves as the main street for the Gallaudet University campus and residents of Wards 5 and 6, as well as an increasingly popular regional destination following the development of Union Market and the NoMa business district. This study seeks to effectively balance the transportation needs of all users of the corridor. DDOT is committed to ensuring that Florida Avenue, NE is a safe transportation corridor and wants to engage with those who live, work and recreate in the area. The study process will include three public meetings at key stages in the planning process, and all interested stakeholders are encouraged to attend. In addition, the public is encouraged to submit ideas and input regarding transportation improvements along Florida Avenue, using the online mapping and comment features on this web site. In addition, a Community Outreach Advisors group will be providing guidance to the DDOT team throughout the planning process. Initial concepts and alternatives, as well as public meeting materials, will be posted on the study web site as the study progresses. Additionally information will be posted at http://www.floridaavesafety.org.